Maite Cazorla takes the ball up the court on the fast break. Photo by Samuel Marshall/Eric Evans Photography. 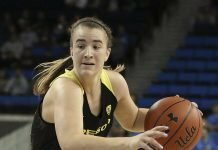 Oregon players have generated many headlines already this season, as a loaded roster is barreling through the Pac-12 with an unprecedented 5-0 record, at the highest ranking in program history. 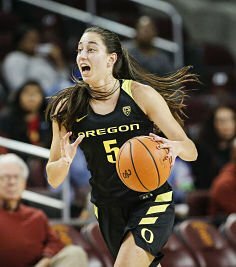 Sabrina Ionescu, with her triple-doubles; Ruthy Hebard, a dominating post presence; and versatile shooter Satou Sabally are already NCAA stars, despite being underclassmen. But it is junior guard Maite Cazorla who has been the bedrock of the nation’s eighth-ranked team. Cazorla, a native of Spain, has started every game of her Duck career, and averaged around 10 points per outing each season. Head coach Kelly Graves said her reliability has been critical to the team’s success, which included an Elite Eight run in last year’s NCAA Tournament. Cazorla isn’t shy, however, about showing up in big game situations. She did it in last year’s Tournament against Duke, and last weekend made a statement when Oregon visited USC and UCLA. 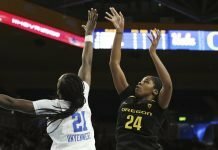 On both nights she was the team’s top scorer, with 18 and 17 points, respectively, to propel the Ducks to their first sweep of the Southern California schools in program history. “We don’t win either of those games if she doesn’t have the nights she did,” Graves said. According to Cazorla, Graves told her to be aggressive on defense, and to run sets on offense. So she settled into a smooth pick and roll and created space on the court for herself and her teammates to score. Hebard said Oregon players feel good knowing they can count on Cazorla. 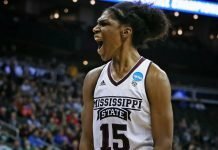 “Just her being aggressive and having the confidence to know that she can score and she can pass, and being the leader that controls everything on the court is something that we’ll need all the way through the season,” Hebard said. Her first three months in Eugene were challenging because of the language barrier and the playing style of the United States, which she said is more aggressive. However, Cazorla’s teammates and coaches knew she was struggling, and were integral in supporting her during her transition. In her freshman year, the Ducks depended on Cazorla to be a key scorer. With the emergence of Ionescu, Hebard, Sabally and the development of a deeper roster, Cazorla’s minutes have declined. But she said that she prefers to be more of an assist-type player than a primary scorer, and she puts team performance over her own statistics. “It’s our show more than my shot,” Cazorla said. Graves said her effect for Oregon goes beyond statistics. “Once you get her talking, I think she’s the (funniest) person ever, and she has probably one of the biggest hearts on our team,” Hebard said. The Ducks host No. 18 Arizona State tomorrow.